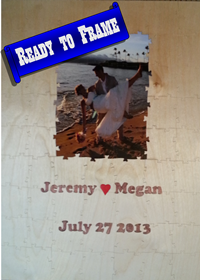 If you are looking for a unique wedding guest book idea, then consider my Anderson Woodcrafts wedding guest book puzzles. 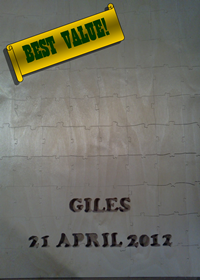 Made from 1/4" Baltic Birch plywood my guest book puzzles are available in three basic styles, with other custom styles being available upon request. 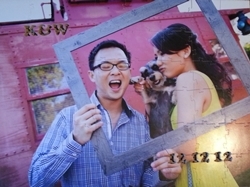 Wedding guest book puzzles may feature an image that you upload, may be simply a blank jigsaw puzzle, or may be a combination of the two. Each wedding guest book puzzle is cut into approximately 2"x2" pieces, an optimal size for your guests to sign and leave a brief personalized message. Heart shaped interlocks are typically used, with an average of eight interlocks per puzzle piece. This number of interlocks is a great balance betweeen a fun degree of difficulty and optimizing the signable area of the puzzle. For those who wish to have a more challenging cutting style it is available upon request, however it will reduce the overall signable area of the guestbook. As with some of my other custom jigsaw puzzle lines, custom pieces (called figural pieces) may be cut into your puzzle. They may be the name of the bride & groom, the date of the wedding, images of the couple's hobbies or almost anything else that would have significant meaning to your wedding. When sizing your guest book, you will typically need a puzzle with approximately 7 pieces for every 10 guests on your guest list. Usually guests attending as couples only sign a single piece, so it may not be necessary to order one piece for every guest. Another way to calculate your required piece count is to allow one puzzle piece for each RSVP that you receive back. For additional help in finding the correct product to meet your needs, use my online design tool.